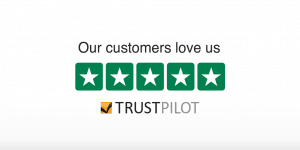 This post is a follow-up on a case study we posted a month ago wherein we showed a client a better solution using DCF Exchange higher yield guaranteed and period certain annuities. The client is in the final deliberation stage and bounced questions off an ill-informed other advisor. 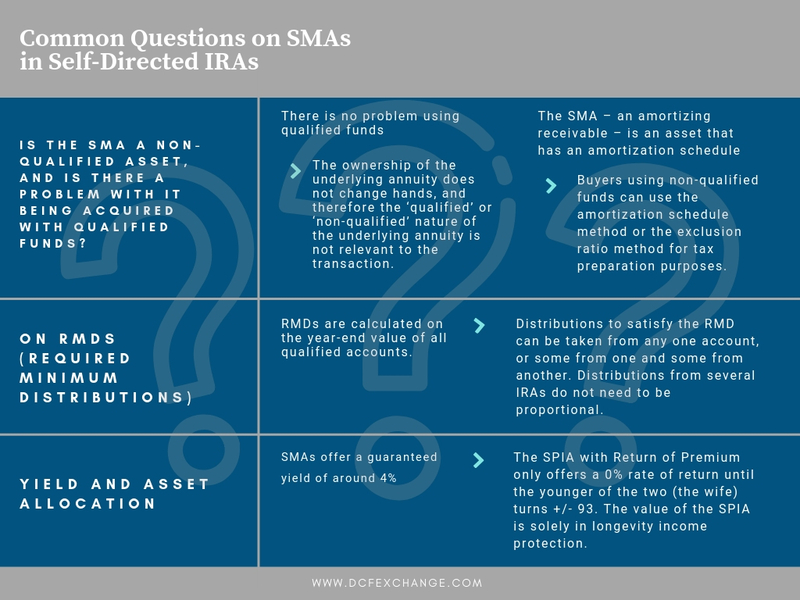 A few questions about SMAs in self-directed IRAs revealed a misunderstanding, and hopefully, this post clears a few things up about the acquisition and allocation processes. Read below. Question #1 - Is the SMA a non-qualified asset, and is there a problem with it being acquired with qualified funds? Answer: There is no problem using qualified funds. An SMA is an amortizing receivable and can be treated the same as any other note receivable. The ownership of the underlying annuity does not change hands, and therefore the ‘qualified’ or ‘non-qualified’ nature of the underlying annuity is not relevant to the transaction. When the right to receive the payments is acquired by an IRA, the payments pay into that IRA’s cash account and the money remains qualified until such time as the owner takes a distribution from that IRA. 1a) Is it inadvisable to acquire an asset with an exclusion ratio using qualified funds? Again, this is an ill-informed question that reflects a misunderstanding of the underlying asset. The SMA – an amortizing receivable – is an asset that has an amortization schedule. Buyers using non-qualified funds can use the amortization schedule method or the exclusion ratio method for tax preparation purposes, as discussed HERE. But for buyers using qualified funds, 100% of the funds received into the IRA are tax-deferred until distribution, whereupon they are 100% taxable. The amortization schedule and exclusion ratio are irrelevant to a buyer using qualified funds. As to whether it’s advisable or not misses the point. The tax consequence depends on weather it’s the person or their IRA acquiring the asset, and so if an an SMA as an asset makes sense depends entirely on the client’s overall situation, RMD requirements, and their total portfolio of qualified and non-qualified assets. Question #2 - What about RMDs (Required Minimum Distributions)? Answer: RMDs are calculated on the year-end value of all qualified accounts. Distributions to satisfy the RMD can be taken from any one account, or some from one and some from another. Distributions from several IRAs for RMDs do not need to be proportional. In this discussion, the proposed secondary market annuity allocation was to use the client’s self-directed IRA to create income of +/-20 years. The client can elect to take that income as a distribution, and in so doing will take out qualified money to apply against his overall RMD requirement. Alternatively, he may choose to let the money accumulate in the cash account in his SDIRA, and take his RMD from another qualified source. It’s up to him. 2a) Will the proposed allocation be worth more or less on 12/31 than it is today? That depends entirely on the assets acquired, the cash flow produced by those assets, and the distributions taken by the client. The proposed allocation is to income streams, and assuming the income generated is taken as a distribution, then logically the IRA balance would be lower at year-end than at inception, due to the withdrawals. 2b) What is the value on 12/31? This is shown on the amortization schedule attached to each cash flow, on the last page, under the year-end valuation summary. This is the value input into the asset management system at the self-directed IRA custodian for year-end valuations. Amortization schedules are available for download from our inventory page and included in the closing book. In this scenario, the client was considering an allocation to SMAs and comparing against a similar principal amount/ lower payout allocation to a joint life SPIA with return of premium rider. SMAs offer a guaranteed yield of around 4% (depends on the specific assets selected, but is typically not less than 4% for the term selected). The SPIA with Return of Premium only offers a 0% rate of return until the younger of the two (the wife) turns +/- 93. The value of the SPIA is solely in longevity income protection. In this situation, with significant overall assets and pre-existing guaranteed income, the risk of outliving income is non-existent. Therefore, the logical, prudent and responsible allocation is to create guaranteed income with a good rate of return but primarily for the surviving spouse’s peace of mind, and leave remainder assets in the market for long-term growth for inheritance/legacy purposes. 3a) It was asked if it made more sense to not use qualified funds to buy this income. Given what I understand about the client’s situation, it seems that he has significant IRA funds and that RMD’s will get more significant as a % of assets each year as they age. In my opinion, it would be advisable to create as much of the essential and discretionary income needed from qualified sources as possible, as the IRA must be taken at some point. Yes, there is taxable income, but if you continue to defer and grow qualified funds into your 80’s and 90’s, you run the risk of escalating into a higher tax bracket in the future simply due to higher RMD requirements, regardless of if you need the income or not. As a related item, it would be wise to allocate all available non-qualified funds to tax-efficient deferred growth, where a step-up in basis may be anticipated by heirs. Again this would be planning for legacy purposes, and should only be done when there is more than enough guaranteed income to satisfy all current income and RMD needs. Hopefully, this helps other advisors with their sales situations, and as always, feel free to call or email with any questions.